After learning about each of the emotions one by one (you can find the list of emotions on my Start Here page), we arrive today at the final emotion in the happiness group: joy! Joy is different from happiness in that it is deeper and larger somehow. It is closer in its essence to contentment, but instead of coming forth after an achievement (as healthy contentment does), joy seems to come forth during moments of communion with nature, love, and beauty – when you feel as if you’re one with everything. If you can recall the expansive, radiant, and powerfully calm feelings you have when you’re in your favorite natural setting at the most beautiful time of day, or when you’re with a person or animal you love and trust utterly, you’ll be able to identify joy. ACTION REQUIRED: Joy arises to help you feel a blissful sense of expansiveness and connection to others, to ideas, or to experiences. THE INTERNAL STATEMENT: Thank you for this radiant moment! Be aware: Extreme joy (exhilaration) is a state to approach with care, especially if it cycles continually with depression or sadness. Repetitive exhilaration or flights of giddy mania may be a sign of emotional dysregulation; if so, please take care of yourself and reach out for help. Joy is considered the queen of all emotions – the one we’re supposed to stay in at all times, and in all situations. As such, joy is possibly the trickiest and most dangerous of all the happiness-based emotions; not in and of itself, but because of the way we treat it. Joy is almost treated as an orgasmic emotional state – as a peak experience – which means that some people spend a lot of time working toward it as a goal, instead of living consciously and appropriately in relation to it. 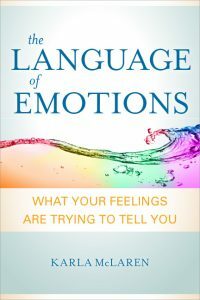 If you understand emotions as action-requiring neurological programs that live inside you, and as specific aspects of your cognition that arise for specific reasons, you’ll begin to ask yourself: “When I’m chasing after an emotion, where exactly am I running to?” Or from? When joy arises naturally, it often does so after you’ve come to the end of a long and arduous path; for instance, you often have to travel a long way to get to your favorite natural setting, just as you often have to struggle through painful relationships before you find your life’s true companion. For this reason, joy and contentment are more connected to each other than to happiness – because both joy and contentment (when they’re healthy) arise in response to honest work and real triumphs, whereas happiness usually arises to give you a quick and rejuvenating intermission from all the work you need to do before you can truly feel contentment or joy. This special relationship between joy and hard work is not universally understood, because most people are surprised by joy and see it as a magical gift from the cosmos rather than a natural human emotion. But joy isn’t magical – it’s an emotion, and it has a specific purpose. Joy ebbs and flows reliably not only in response to hard work and contentment, but also to an emotion that may surprise you: Joy often follows or travels alongside grief – which may seem puzzling if you don’t understand the opportunity for communion that lives inside both joy and grief. These two emotions are deeply interconnected, because if you enter into the beautiful work that awaits you in the deep river of grief, you’ll become one with the continuum of life – one with the births and deaths of all souls. That’s communion, which places you immediately into the territory of joy – while you’re in the river performing your sacred grief work, and after you come up and out of the water to rejoin everyday life again. Whole people understand that joy is not a goal in and of itself, but that joy arises of its own accord in a life that’s resourced with honest hardships, triumphs, ordeals, loss, hard work, love, laughter, grief, and wholeness. In The Language of Emotions, I share my five Empathic Mindfulness Skills, and one of them (Rejuvenating Yourself) actually uses joy as a healing and rejuvenation tool. I want people to get used to joy, so that they can interact with it calmly instead of chasing it all over the place and losing their grounding and their focus. Your grounding and integrating task when joy arises is to connect the seemingly otherworldly sensations in joy to the very worldly and full-bodied work you do to bring your joy forward. When you can approach your joy as an emotion, and not as a reward, you’ll be able to celebrate and then release your joy naturally (Thank you for this radiant moment!). Then, you can get back to your real work, which will lead you naturally and inevitably – again and again – back to your real joy. When people around you are imbued with happiness, contentment, or joy, there is very little for you to do but enjoy them. However, this can be quite a difficult task if your own relationship to any of these emotions is skewed. In order to truly honor an emotion in another person, you’ve got to understand it in yourself first. In the territory of happiness, this means knowing how to celebrate and release your happiness-based emotions instead of holding onto them for dear life, or dismissing them as signs of childishness or dippiness. Let me prepare you right now for a fall, because you’ll almost certainly make mistakes in this emotional territory. You may clumsily disparage the happiness in another person, or overpraise or inhibit someone instead of helping them create room for their own natural contentment. You may also try to hook yourself into another’s joy and convince them to imprison it so you can experience it vicariously. We’ve all had so much bizarre socialization in regard to the happiness-based emotions that most of us behave very strangely around them. Therefore, be gentle with yourself and know that you’ll improve if you can fall and rise again, make amends, and burn your contracts with the truly odd ideas we all have about happiness, contentment, and joy. We’ve looked at the three healthy happiness-based emotions: contentment, which is like a deep and healing breath that follows a sense of inner achievement; the giddier state of happiness, which bubbles up, takes your hand, and skips with you into the bright future; and joy, which arises when you’ve worked to arrive at a place of beauty and full-bodied communion. However, there’s also an often frantic emotional state that arises when you try to cement yourself into the territory of joy: It’s called exhilaration. In exhilaration, you become not happy and silly, but skittery, delirious, and ungrounded. Natural contentment and joy tend to be very grounding, and though happiness adds a lightness and frivolity to you, it doesn’t actually unground you. Happiness can help you feel like a hopeful kid again, but exhilaration can make you feel hyperactive and nearly fraught – as if your happiness will disappear if you take your eyes off it for one second. Exhilaration can feel very good and empowering, but you have to be very careful in this emotional territory. Exhilaration prompts you to keep moving from one “happy” thing to the next – from one bite of comfort food to a whole cake in one sitting; from one pleasant idea to a hundred better ones; or from one stimulating love affair or ecstatic purchase to the next, without ever stopping to feel any grief or remorse about your erratic behavior. Exhilaration can throw you into addictions and distractions of every kind, and it’s a clear sign of a conflict between your emotions and your intellect (due to your refusal to feel a full range of emotions, and your inability to think clearly). Though endless happiness is celebrated the world over, unending exhilaration brings just as much trouble as unending depression, anger, fear, or despair. All emotions can be damaging if you imprison them, just as all emotions can be healing when you know how to work with them them honorably. Imbalances in any emotion bring about turmoil, but the dramas of exhilaration addicts are often deeply unsettling. Exhilaration can spin people into extreme levels of activity; they may become chaotic and self-destructive, or wildly and unrelentingly industrious (this latter condition is considered less hazardous than the former, but both can lead people into exhaustion or depression). Healthy happiness, contentment, and joy bring delight into your conscious awareness – but only if you treat each one honorably. If you try to paste a haunted smile onto your face and throw yourself into a nightmare of never-ending exhilaration, you’ll destabilize every part of yourself. Healthy joy, happiness, and contentment are meant to be as fleeting as healthy anger, grief, fear, or any other emotional states. They were never meant to be held hostage or used to gain prestige in an emotionally stunted world. If you tend to get into feedback loops with your joy, and exhilaration becomes troubling for you, you can learn to work with your joy in more intentional and mindful ways. You can do this with my empathic Rejuvenation practice (it’s in The Language of Emotions and in The Art of Empathy), or with other forms of mindfulness training. Remember that there are no positive or negative emotions; all emotions are natural and necessary reactions and sensibilities that should flow freely. Enjoy your happiness, your contentment, your joy, and your bliss – and then move on as you’re meant to. You have more work to do, more emotions to feel, and more life to live. Thank your joy when it arises, but also remember to thank yourself. Your joy is a part of you, and you don’t have to chase it down or imprison it. Free your joy! Karla, would it be accurate to say that contentment is an emotion that has a sort of inner aspect, with a backward glance from the present; that happiness has a larger inner aspect, with a vision of the future; and that joy is more expansive, with a larger outer aspect, maybe with a larger sense of the present, as well as the past and future? Hello Randall, yes, I feel contentment as an inward-facing emotion, though some people use the word “content” to describe feeling happy in their surroundings or with their external situations. I also agree with joy’s outer, expansive aspect. As for happiness, I use the word to denote a kind of outward focus. Sometimes it’s focused on the future or things to look forward to, but sometimes it’s about feeling happy with what is, and with what’s going on in the present moment. Words are fun, but they can be such a limited way to describe the world! I really wonder if other languages have more clear ways of describing the difference between different types of happiness? I like your questions and your nuanced sense of emotions!